The Eureka Montana Quilt Show was a success by many measures. Over 600 quilts were hung up in town that day. It was the highest level of sales achieved in the eleven years that the show has been going. The weather was clear and people looked like they were enjoying themselves walking on the main street and through the Historical Village. 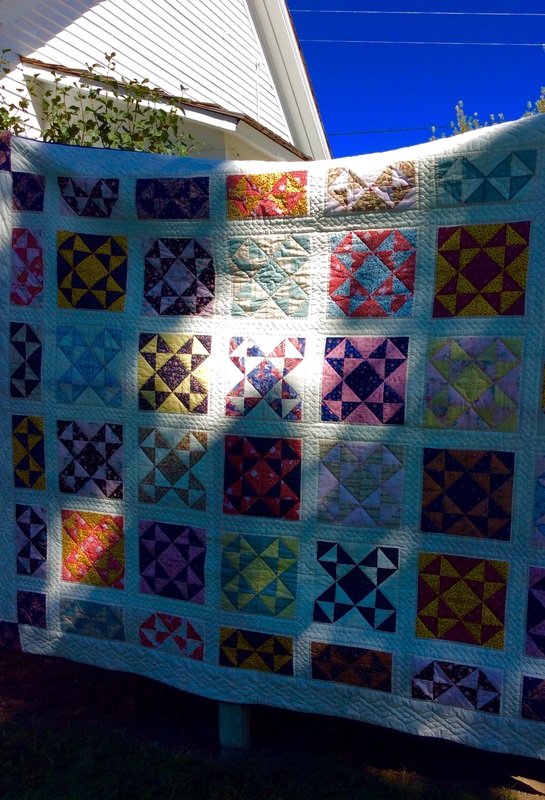 But no one bought the beautiful quilt that the Tobacco Valley Board of History quilters had made. A complete mystery to me because the quilting on it is so intricate. And although I try not to cop an attitude about hand quilting as compared to machine quilting….how ca n a machine possibly put as much love and care into a quilt as a group of women stitching by hand? So it is sitting in the cabinet at the old school house waiting for the right individual to stop by to purchase it (or call as we do ship). 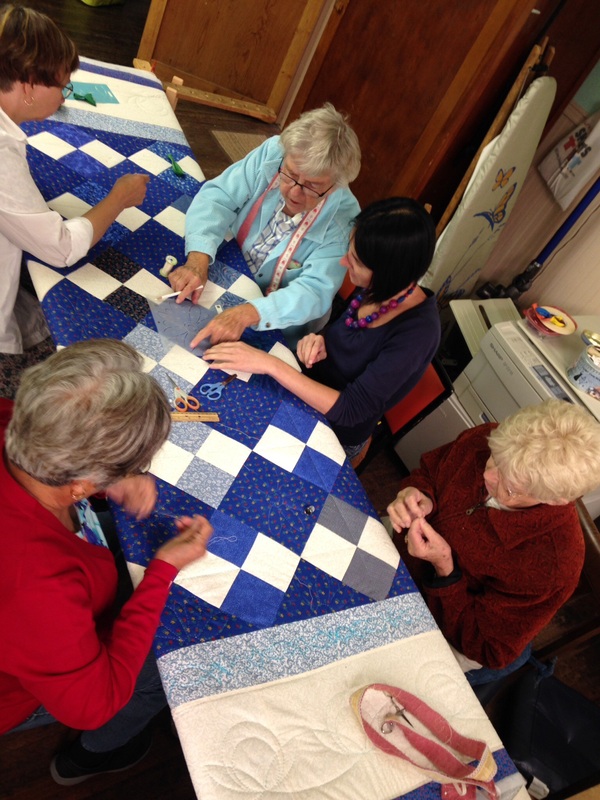 And the quilters are busy doing other things to make the Village as good as possible. Numerous ones worked at the quilt show selling raffle tickets for another lovely quilt or helping at the museum. Cathryn has been archiving this summer. Bev fills in if one of the docents is ill. Lynda helped prepare food for the Dinner on the Lake – this evening! Dianne deposits any money made and makes sure the bills are paid. And some of us still show up on Friday mornings to work on the blue quilt that we sincerely want to get finished by September. I am suppose to give a Brief Talk this evening at the Dinner on the Lake event to thank everyone who helped and to encourage people to support the Village. It’s a challenge because so many people help from the ones who prepare the food, to those who sort out the chairs and tables, Sally making table arrangements, Ben playing music, Rick and Lynn lending their house for the event, Carol selling tickets. The complete list would make a Brief Talk impossible. And then the ask as they say in the funding raising business. How can I possibly explain the number of stitches needed to pay the electric bill? Or the number of raffle tickets we would need to sell to cover the expense of the new roof? And it’s not just about money because we need volunteers as well to help with maintenance and building projects. A Brief Talk that can encompass all of this seems impossible but I know the women who quilt at the Village are an incredible group so maybe their juju will be with me as I stand up in front of the diners this evening.